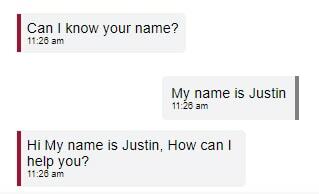 User input is one of the key element for building a chatbot. 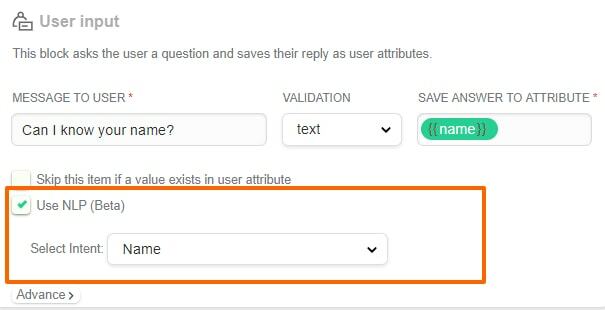 With the help of user input you can take different inputs from user in the form of text, phone, email, number or you can even set custom validations. While collecting information from the user, they can respond to your question in different form. Your message in user input- Please can I know your name? The respond can sometimes confuse the bot and it may give an unpleasant reply. As shown below. Here the bot failed to catch the main keyword of the message i.e the name. To avoid this you can add NLP at user input level. When you enter NLP at user input, bot will able to detect the correct term from the user response. 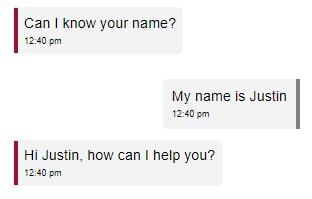 This is how bot responses when you set User NLP. Follow these steps for setting up NLP at user input. Step 1: Go to bot dashboard & set your user input. Step 2: Go to setup AI > Advance AI and create intent relate to your input. Don’t miss to check- Use with “User input” block at the bottom and save the intent. Step 3: Now go to user input you created and enable Use NLP and select intent for your user input. (currently this feature is in beta). After following these steps, you can check how this works by clicking on the demo tab. We’re sure you would not like to miss this feature head to your floatbot and make this feature live!